TORONTO -- Ontario is introducing new regulations to dramatically reduce the number of acres planted with corn and soybean seeds coated with a relatively new class of pesticides known as neonicotinoids, which are highly toxic to bees. Neonicotinoids are nicotine-based insecticides that contain neurotoxins which make all parts of the plant harmful to insects feeding on them, don't break down quickly in soil, and can be transported by runoff from fields to rivers and lakes. 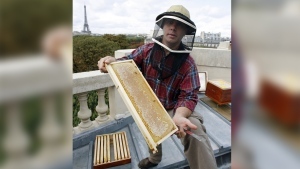 Most of the food we eat and Ontario's natural habitats depend on a healthy pollinator population, and reducing the use of neonicotinoids will help protect bee colonies, said Environment Minister Glen Murray. "Our government is taking necessary action to protect these vitally important species and the ecosystem they support from the effects of neurotoxic neonicotinoids," he said. Virtually 100 per cent of corn seeds and about 60 per cent of soybean seeds planted in Ontario are treated with neonicotinoids, figures the province wants to reduce by 80 per cent in just two years. For the 2016 planting season, farmers will be able to use the pesticide-treated seeds on up to 50 per cent of their corn and soybean crops, but must prove they have a pest problem before using any additional neonicotinoids. Starting in the 2017 planting season, farmers must complete a pest assessment report to prove they need the neonicotinoids before any neonic use will be allowed. Over the last eight years, Ontario beekeepers experienced unusually high losses over the winter months, reaching 58 per cent in 2013-14. 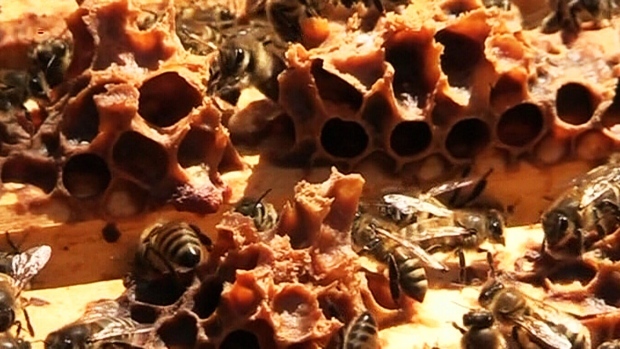 The government hopes its regulatory changes will lower over-winter losses to about 15 per cent, a level considered acceptable and sustainable by the bee industry. The Ontario Beekeepers Association praised the government "for having the courage to act in the face of intensive lobbying and pressure from the AgChem industry seeking to protect their profits." Ontario Federation of Agriculture president Don McCabe said farmers "care about the health of pollinators" and will work with the government on implementing the new regulations to keep the concerns of farmers top of mind in the pollinator strategy. Environmental groups also applauded Ontario's move to regulate the use of neonicotinoids to help protect bees, birds and other pollinators from the toxic pesticides. "Ontario's approach is reasonable and balances the need to protect the health of pollinators with the need to protect agricultural productivity," Environmental Defence said in a statement. Elaine MacDonald, a scientist with Ecojustice, said the "use of neonic-treated soybean and corn seeds has become indiscriminate and routine, whether or not pests are present." The David Suzuki Foundation praised Ontario for being the first jurisdiction in North America to regulate the neonicotinoids, which were covered under Ontario's 2009 ban on cosmetic use of pesticides on lawns and gardens. "Based on European countries' experience with neonic restrictions, we look forward to healthier pollinator populations and sustained crop yields in years to come," said foundation analyst Lisa Gue.